To look at the posts I made a year ago, no… even four months ago, sheer terror, I can only hope that I get better and better for everyone. 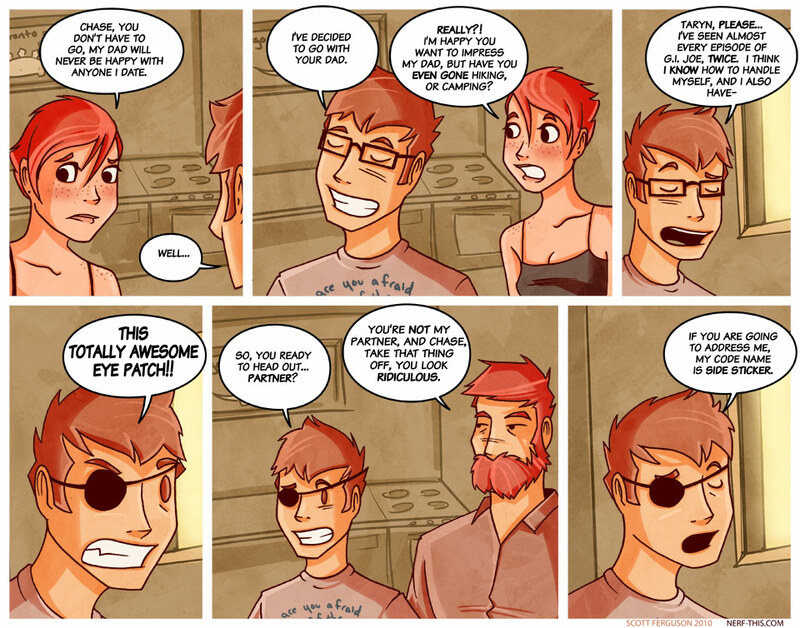 So many wonderful uses for an eye patch. Was it a fun purchase or were your eyes prey to seagulls? a friend gave one to me, even though I wish (in an alternate universe) I could wear my eye patch proudly… I’d blame this on bears of course, or if the seagulls were 10 feat tall. Don’t underestimate those seagulls, man, they’re planning something. Those beaks are the perfect shape for eyeball attacks. But, yes, ten foot tall seagulls would be a pretty epic eye patch story. I’m all for a good, Level Up. Qu’est-ce qui est l’adresse de quoi? Ou plutôt une maladresse? What program do you use to make these comics? And do you draw them online, or start out with a paper draft? Plus, I wanted to say this may be my favorite part in the comic yet! This comic (not this particular one, but all of them!) have got me thinking about making my own comic site. Only I have no idea how to, erm, make a site in the first place…and how to get my comics lookin’ like THAT. But, putting all that aside, your comics ROCK! Haha, thank you for the kind words, I do all my art for Nerf This on paper, on 11 x 14 bristol or paper and scan it in. I have an intuos tablet I use to do the rest (coloring, shading, etc) in Photoshop, and lastly I use Adobe Illustrator to do the lettering. Oh Adobe, how we love your oh so overpriced software. I would have thought there would have been more Ai instead of Ps to be honest. And Fanboy kid, making websites is easy, as long as you don’t plan on starting with any db stuff. I could crank one out for you in a matter of a couple hours if you send me a design and a color scheme. Crossing my fingers about this redraw thing. If I don’t like, I will find you and shoot flaming marshmallows at you until you change it back. No lie. 10$ says Chase is gonna sing the “Annoying Song” in the car, the entire trip. It’s always good to revamp every once in a while…like spring cleaning, lol. I’m sure that, no matter what, your loyal fans will love it no matter what, though it will take some getting used to. Every artist progresses as they go, and what they drew in the past isn’t necessarily bad, but merely a learning process to get to where they are now. On top of that, show me ONE artist who hasn’t improved upon their drawing? It’s all a part of being an artist. So be proud, Scott!! We LOVE you and your comics!